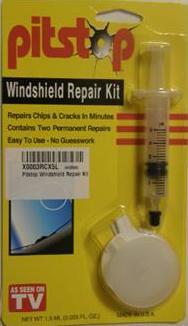 The following information about this repair kit is provided to help you assess this product in relation to the repairs you need to complete on your vehicle and to allow you to make comparisons to other repair kits of a similar nature. Each of the repair kits covered by this guide are intended for specific types of repairs and under differing conditions. For an easy comparison of the differences of this kit in relation to others, please see the Kit Comparison Summary page. If this is your first encounter with windshield repair, please see our free course, Windshield Repair 101. It covers and explains windshield repair in detail as well as the types of kits required for the various types of windshield damage. 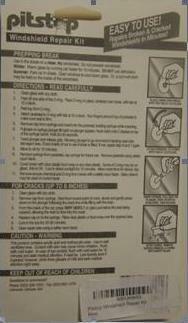 For information and commentary relative to this kit, please continue on this and subsequent pages about this kit. This is a Pedestal type repair kit with a UV activated epoxy resin. Pedestal applicators are generally reusable and can complete more than a single repair. With this type kit, repairs are generally limited in number by the amount of repair rosin, and number of Adhesive Discs available. Use in the shade on a clean, dry windshield. Do not prewash windshield. Winter: Warm glass by running car heater for 10 minutes. Do not use defrosters. Summer: Park car in shade. Open windows to cool down glass. Or, a cool wet cloth may be held on the inside of the windshield. Contains: Methacrylic Ester and Acrylic Acid. See instructions below, as this is a short bullet point summary of the kit and process.